Angus Buchan gives his Bible to one of a group of gangsters who responded to an alarar call at It’s Time Cape Town on Saturday. Saturday was an extraordinary day as possibly the biggest crowd ever seen at an event in Cape Town gathered to pray on an open space in Mitchells Plain. 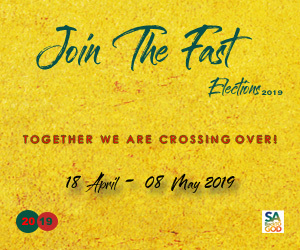 The peace of God was tangible at the Swartklip Sports Ground prayer venue and on the surrounding streets which are notorious for gang violence and where people had predicted there would be trouble as there had been at other events at the same venue. And, in one of many signs of God’s goodness and favour on the day, soft rain began to fall as the crowd began to worship — to be followed by several more gentle showers that were appreciated in the drought-stricken area. But the most extraordinary scene of all began when farmer evangelist Angus Buchan, who led the prayer time, called on gang leaders present to come to the front to “exchange that gun for a Bible”. There was a nervous hush as Buchan repeated the unusual altar call after leading the crowd estimated at more than 150 000 in a prayer of salvation. As the worship team sang Buchan continued to urge gang leaders to come forward. At last one man came forward — then another — and another — until about a dozen men, and two older women — one a Christian worker and the other a mother of one of the men — stood in front of the platform. Descending from the platform to stand with the gang leaders, Buchan said he was going to do what God had showed him in a dream. He said the Lord had impressed on him that the gang leaders were leaders — they were just going in the wrong direction — and that He wanted to use them in His kingdom. He told the men that he wanted to give them something because he wanted to show them that they were loved by God, by those present at the It’s Time prayer event, and by South Africa. 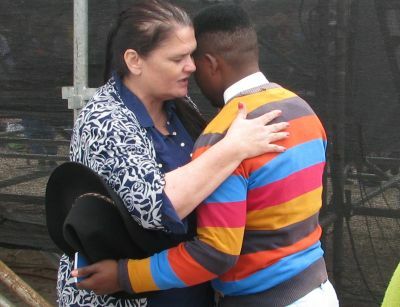 A woman hugs one of the gang leaders who had earlier responded to Angus Buchan’s altar call and been given the evangelist’s cowboy hat. “You are going to be a preacher of the gospel of Jesus Christ,” he said to another of the young men as he gave him his “very special Bible given to me by my family”. Buchan gave his jacket, checked shirt and boots to other young gang leaders before returning to the platform to lead prayers for Cape Town, the Western Cape and South Africa in his jeans, white t-shirt and socks. “Those men are a representation of many others but I am believing the Church will get around them and rehabilitate them, he said from the stage. 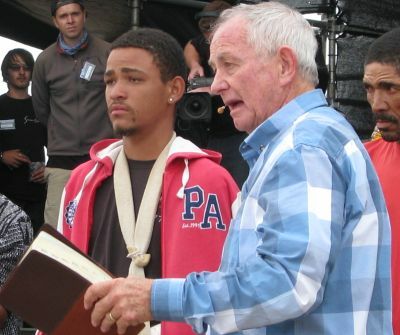 One of the first members of the Church to rise to the challenge of following up the repentant gang leaders is Ashley Potts, director of the Cape Town Drug Counselling Centre, who Buchan refers to as his “Macedonian man” because of his role in his conviction that God wanted the It’s Time prayer event to be held at Mitchells Plain. Buchan selected the venue after reading Potts’s testimony in a Scripture Union booklet. “It has been a real honour and quite daunting,” Potts, who grew up in Mitchells Plain, said in a telephone interview today. 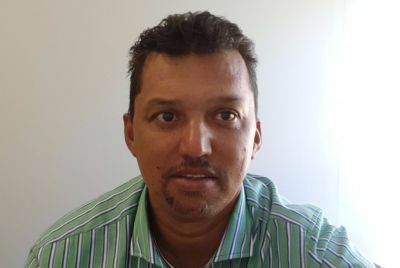 Ashley Potts, director of the Cape Town Drug Counselling Centre. Last night he visited two of the young men who had responded to Buchan’s altar call and he was meeting another tomorrow afternoon. The men’s names were not captured at the time, so he was tracking them down with the help of the community, he said. He said he spent an hour with the two men and their mother last night and was surprised by they way they spoke. “They had already done lot of things I was coming in to suggest to them,” he said. “It was beautiful to witness how God has already transformed his heart and way of doing things,” he said. However Potts said his hope was to give the men an opportunity to gain some stability in their faith before they were called to share their testimonies and talk about their experience. “If I had my way I would rather they just silently grow in the faith through close mentorship and get involved in the church and gain stability and faith,” he said. He also said he would be talking to leaders of various gangs and of the Firm, the coalition of gangs, to ask them to allow the church to walk the road with the new converts. “You don’t just leave a gang and walk away. That’s suicide,” he said. He said it was also necessary to get the buy-in of members of the community so that the discipling of the young men was not undermined by negative words and attitudes. “Let’s trust that God will transform the community through them [the young men],” he said. Buchan told Gateway News yesterday that It’s Time Cape Town had been one of the most moving events that he has been part of in 39 years of preaching the Gospel. He said several days after the event he was still feeling surreal — “like walking on the water”. He said he had experienced the power of the Holy Spirit and the wind of revival blowing. He said they planned to put up huge billboard at three entrances to Mitchells Plain with possibly a picture of a sunflower and the words “The Flower of Cape Town” — a reference to a word he shared at It’s Time about a name God had given him for Mitchells Plain. We serve a great God#! Thankyou Jesus for everything you ve allready done !! Our God of peace, the Giver and the Author of peace, who brought Jesus our Lord and Shepherd from the dead and sealed an everlasting eternal Covenant with us through His blood, to equiped us to do His will is the same yesterday, today and tomorrow. “Its Time” should happen in our hearts on a daily basis. Stay clise to Him and He will show you the way. How powerful is our mighty God. This is God’s moment for Gangsters & their leaders to step up for Jesus. God is faithful and this is just the beginning of a great revival that is coming to Cape Town.God bless uncle Angus Buchan. Fatherlessness is the cause of most social ills in our communities. In jesus name i pray that every gang leader will be a Nick Cruz. To the Glory of God, and the extention of His kingdom.Amen! Father almighty come show us your Spirits power! You have touched our hearts, Jesus come complete the work! We broadcasted this event together with 3 other Christian Radio Stations. This was a first in the history of Christian Radio in The Western Cape. We were touched and felt that the Holy Spirit equally touched our lives. We often give so much of ourselves in radio and were so blessed while witnessing the salvation of the gangleaders and the unity of our listeners in the communities where many of our interviews and testimonies derive from. PRAISE TO THE ALMIGHTY GOD! May the airwaves be focussed on God and God alone! After Saturday my life will never be the same. With the Altar call for the gang leaders I could hear the mother’s, wifes and grandmothers praying. I realized God answered many years of prayer. Praise God. What an awesome privilege to have witnessed this! Thank you uncle Buchan for being obedient to the Holy Spirit. Thank you for being such a good role model. May GOD bless you and your family!! Praise God for His love for all of His children. Jesus gave His life so that Mitchells Plain could be saved.uncle Angus was born for a time such as this. It was a faith-enhancing experience to see those men coming forward. There are no limits to what God can do. May God’s presence never leave M.Plain and let those men, like the 12 apostles, grow into a strong leadership for Christ in that area. The volunteers were at the grounds 4:30am to pray and anoint each other. At 6am there was a rainbow at Doves peak. The rainbow touched the ground and heaven not in a circle as we know it. God remembers His commandment even before anything happened God showed up! I was so blessed to be able to attend. I give all praise, honour and glory to Almighty God for His presence and anointing over the entire event. Cape Town for JESUS!!! I am so touched by this meeting and the anointing flowing from there. Thank You, Lord for your servant, Angus Buchan that you sent and he obeyed in such a humble way. Praise You, Lord! God said in The Scriptures”Go thee out on the plains and streets and gather the sinners to me” ” as the INVITED did not want to come to MY wedding.” How wonderful the sinners are coming in at Mitchels plane. PRAISE GOD ALMIGHTY THIS EASTER THAT WE AS BORN AGAIN CHRITIANS IN CHRIST can pray for those gangsters and others to come to Jesus Wedding day by His Blood Shed on Calvary. knee down and say “JESUS I ECEPT YOU AS MY LORD AND SAVIOUR I HEREBY CONFESS MY SINS AND ASK FORGIVENESS IN JESUS NAME” Amen and amen. God blessyou all in His Wonderful name go out and tell everybody you meet what you just did. That will strenthen your faith and you will grow spiritually every day. amen.Heleen Mosselbay. We serve an awesome God. Thank You Father for Your love. Ons mag nie nou laat slap lè nie. Onwards Christian, marching as to war, with the cross of Jesus going on before. Let us be fervent in prayer. Our battle’s not against flesh and blood, but against spiritual wicked powers of the air! The work of the Holy Spirit is what guides us towards service for the greater good of the Kingdom. It’s an honour for me to be of service in any way. It is my prayer that the church will extend its reach beyond the four walls and become relevant to the communities God has placed them in. I have no doubt that these young men will grow and become leaders of the church of Jesus Christ. I also believe that the 12 who came up was symbolic and that many other gang member will be following in their footsteps very soon. Those caught up in gang activities are yearning for a lifeline which has just become apparent through the ministry of the It’s Time Event thanks to the obedience of uncle Angus Buchan. Ek het saam gebid al was ek nie in die Kaap nie.Die Heilige Gees het werklik soos n wind deur Mitchels plein gewaai en baie lewens aangeraak soos ek gevra het. Ons dien n wonderlike God. I am in tears because of Gods grace and goodness. My heart is for gthe gangs, because God made them also and love them just as much. I praise God for Angus Buchan. I will be praying for the gang leaders who came forward and for Ashely Potts and others who will be supporting these gang leaders in this exciting journey to which God has called them. Glory to God for this testimony, Ashley could it be that Mitchell’s Plein is the King Protea of South Africa? The Lord placed this beautiful coloured nation on the southern tip of Africa as kings and Priests for His kingdom. We rejoice together! Surreal….it was how I described it afterwards to friends…simply surreal…. God is to be praised for everything He has done for Cape Town especially Mitchell’s Plein this season. There is salvation in the Name of Jesus (Acts 4:12). There is Healing, Deliverance, Protection and Prosperity. Those who have been touched by the Holy Ghost they must not lose the touch but cling to it. Praise the Lord! What a testimony – may this extend to the gang areas around our Nation. Jesus give me and others the courage to step out with boldness & be unashamed of the Gospel ! THANK YOU Gateway for great articles and reports may your needs be met in sharing the “good news” !! !